Stringerless foam blank, Volan glassed with reverse scallop deck patch, gel resin and gel resin/glitter decor, pinlines, SAFE set fin box, post-production legrope plug. 1.Large nose to rear, added glitter, green pinlines. 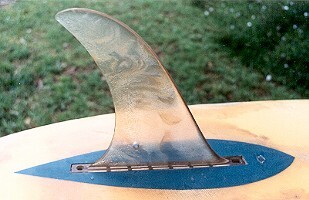 2.Small around fin box. See below. Purchased Geoff Petty, Balmain October 2000. Picked up 2 November 2000 - heavily waxed, no available history. COMMENTS: glitter additive to gel resin is very unusual. Note: Shane Surfboards advertising in this period was known for its unusual images - unfortunately this meant very few boards appear. However due to the rapid variations in design it avoided the potential embarassment of your number one surfer appearing with a brand new superceded model (from magazine layup to news stands was often three months). Similar advertising that deviated from the standard surfer/board/wave was used by many manufacturers in this period. 2. Mick Mock : "The Summer Millionaire (Shane Steadman)"